So, today is January 12th. Twelve days into a New Year. A new year – that wonderful time that comes around every year when we can forget about all of the garbage of the past year and turn the corner. Start over. Make a resolution to ourselves for a new start. Take a second and try to remember some of the promises, often we call them resolutions as we enter a new year. Try to remember some of the promises that you made to yourself on or around December 31st. If you are anything like me, 12 days is an eternity. Trying to remember promises that I made as New Year’s resolutions just a couple of weeks ago is in the distant past. Gone from sight. And usually gone from daily, or at least regular, practice. Too often, I think we forget that baptism is a never-ending journey in God’s grace and mercy. So, do you remember your baptism? Or is it something that you’ve forgotten about long ago. Today we celebrate the baptism of Jesus. Notice that Jesus is no longer a baby in today’s gospel reading. In just a few short weeks on the church calendar we’ve moved from the infant Jesus to the adult Jesus entering the Jordan River to be baptized by John. There is a common thread running through both the birth stories and the baptism stories of Jesus. It’s something that I found quite remarkable this week. Both the birth story and the baptism story of Jesus help usher in the presence of the Holy Spirit in the world. Mary conceives Jesus by the presence and power of the Holy Spirit and the Holy Spirit descends like a dove as Jesus is baptized by John. When we share in the joy of the Sacrament of Holy Baptism as the body of Christ some 2,000 or so year after Jesus’ baptism, do you and I experience the presence of the Holy Spirit in the same way? Do we feel the power of God taking hold in our community of faith, in the families and lives of the one being baptized? Do we really believe that the event of baptism is anything more than the prelude to a few family pictures and some chocolate cake? In his commentary on the gospel of Matthew, Frederick Dale Bruner says that he considers Jesus’ first miracle to have occurred at his baptism. The miracle is that Jesus was humble. 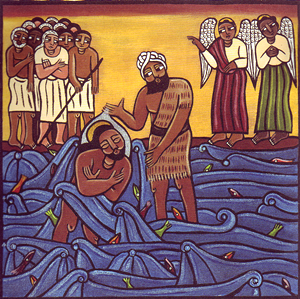 The divine Son of God humbles himself by allowing John to baptize him. This act of humility is an act of obedience to God and solidarity with all humankind. So, do you remember the miracle of your baptism? You and I have an opportunity to do just that during every baptism that takes place in our congregation and in countless other ways throughout our walk together in Christ. You know what, as we celebrate the baptism of Jesus today, we have another opportunity to remember our own baptism and once again experience the power and presence of the Holy Spirit in our midst. You were given a candle as you entered worship today. I invite the ushers to come forward now and begin helping us light these candles. As our candles are lit, I want us to remember our own baptism, because there are many times when I wonder if we really believe in the miracle of baptism anymore. I wonder if we bother to remember our baptism beyond a few drops of water on our head, a couple pictures, and a piece of cake. I wonder, as David Lose offered this week, whether we have missed the profound words of empowering grace that are spoken to Jesus in his baptism and spoken to you and to me in our own baptism. Because you know what, you are a beloved child of God, you are a child in whom God is well pleased. The world around us wants to know if you are strong enough? Are rich enough? Are you beautiful enough? Are you successful enough? Are you skinny enough? In the water and word of the sacrament of Holy Baptism, God says to you and to me, you are enough! God accepts us just as we are, right where we are at, and wants to do great things for us and through us. As your candles are lit, please join me in prayer. Merciful God, we thank you that you have made us your own by water and the Word in baptism. You have called us to yourself, enlightened us with the gifts of your Spirit, and nourished us in the community of faith. Uphold us and all your servants in the gifts and promises of baptism, and unite the hearts of all whom you have brought to new birth. We ask this in the name of Christ. Amen. Brothers and sisters in Christ, I now ask you to profess your faith in Christ Jesus, to reject sin, and confess the faith of the church. Together we affirm our faith with the words of the Apostle’s Creed. Sisters and brothers, you have just made public profession of your faith. I ask you now – do you intend to continue in the covenant God made with you in Holy Baptism. To serve all people, following the example of Jesus, and to work for justice and peace in all the earth? Children of God, do you promise to support one another and pray for each other as we share our life in Christ together as Good Shepherd Lutheran Church. Brothers and sisters in Christ. God has claimed you in your baptism as God’s child. Remember your baptism as you let your light shine! This entry was posted on Sunday, January 12th, 2014 at 8:00 pm	and posted in Recent Sermons. You can follow any responses to this entry through the RSS 2.0 feed.